1. 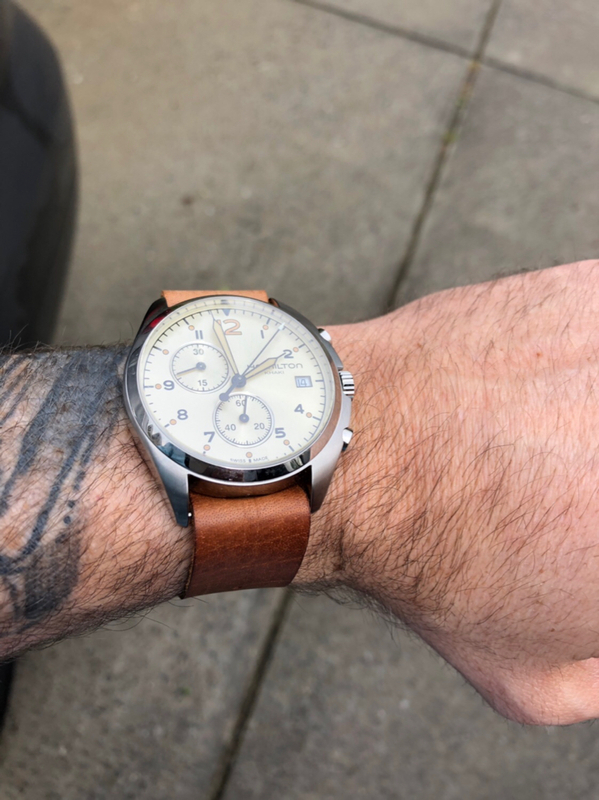 First, of all, I really like the color and texture of that leather NATO. What brand is it? 2. Secondly, how do you like that Hamilton chrono? Does it feel large? 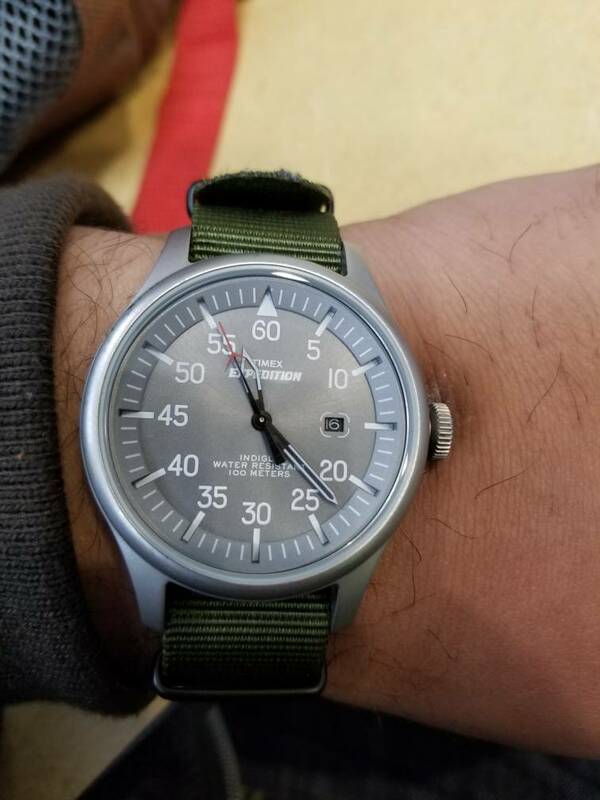 How does it compare to, say, a typical 42mm dive watch? I've always liked that model of chronograph, but I've always been scared off by the size. Since that watch has a narrow bezel, I think that the dial would look huge on my puny wrist. 3. Third, after years of reading your posts here on Dappered Threads, I just realized that your user name is "Id-vs-Ego." I'd been reading it as one long word up until now. LOL. Last edited by TMann; April 14th, 2019 at 10:22 PM. 1. Cheapest nato straps. Its a natural leather that has picked up the coloring from years of off and on wear. It started off very blonde. I wore it in the shower, to music festivals, in the pool, in the ocean...just to make it pick up some real color and wear. 2. its a little big. My wrist is 6.75 and I usually draw the line at 42mm. 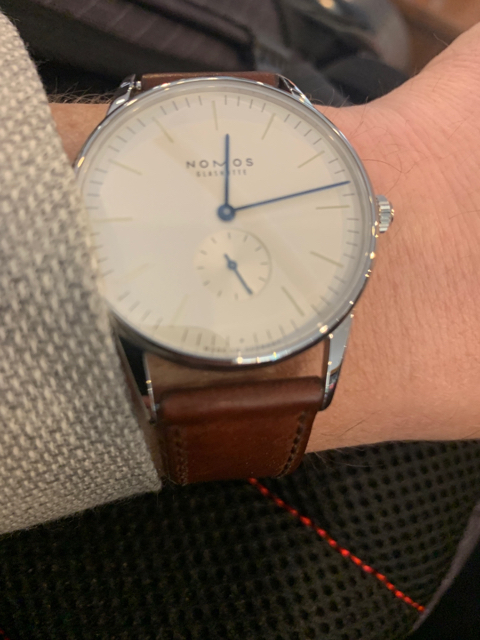 The thing about this watch is the asymetrical design makes it wear a little differently. Even though the case measures 43mm, at least 1-2mm of that is the crown board on the pusher side. So I feel like it wear more like a 40-41mm watch. Plus it isnt thick and hte lug to lug is nice. The slight dome and curve of the case fits my wrist well. I have wanted a pioneer pilot for a while and finally gave up on the auto because it was thicker. I have only had this for a couple of weeks but so far I love it. I like neutral toned dials but white can be very stark. 3. lol, yeah, for some reason I couldnt get the capitalization on this forum. I usually do IDvsEGO. It was my first online gamertag and I have stuck with it in some variation for all my message boards. You can find way more about me by googling that than you can my actual name. But where is superego?? Cheapest NATO straps is where I get most of my straps when I don't make them myself. Bought several of their sport tropic straps they have on clearance ($2 each!). They've got short lengths for many of their two piece bands now! Would be nice if they start carrying shorter NATOs, too. I just realized that your user name is "Id-vs-Ego." I'd been reading it as one long word up until now. LOL. lol, yeah, for some reason I couldnt get the capitalization on this forum. I usually do IDvsEGO. It was my first online gamertag and I have stuck with it in some variation for all my message boards. You can find way more about me by googling that than you can my actual name. I thought that might be a little too tedious to type out.